Life truly is a mystery. Why certain things happen to us, positive and negative, often times can never be explained. For most, the “missing piece of the puzzle” takes time to find. However, for those who have the patience and fortitude to reset themselves mentally and physically for the new challenges that inevitably lie ahead, the payoff can be huge. Like the Butterfly Effect concept, the slightest change in motion, pace, drive, desire, want or need can yield incredible results down the line when put into play. If there’s one tangiable thing that ties UFC fighters Tyron Woodley, Paul Felder, Sergio Pettis, Eric Koch, Belal Muhammad, Gerald Meerschaert and Alan Belcher together, plus many others that have found success in the UFC, it’s the Roufusport Effect. One of the first UFC fighters to put the Roufusport Effect into play with tremendous results was Alan “The Talent” Belcher. Flashback to the beginning of May 2007. Fresh off a humiliating submission loss to the talented Kendall Grove on UFC 69 a month earlier, Belcher knew he had to change his routine, and fast. Belcher moved his training camp north, from Biloxi, MS to Roufusport in Milwaukee, WI, where he prepared for battle against Sean Salmon on UFC 71 only a few weeks later. After submitting Salmon by Guillotine Choke :53 seconds into the first round, Belcher rattled off an impressive 8-2 record between May 2007 and May 2012, racking up an impressive 4 total performance bonuses during that time: 2 Submission of the Night bonuses and 2 Fight of the Night bonuses, which included a $100,000.00 UFC 100 Fight of the Night bonus. Tyron Woodley might not have come to Roufusport in January 2015 looking for a good time, but apparently he found one, and that’s a very good thing as “The Chosen One” ascended to the top of the UFC’s Welterweight division becoming World Champion eighteen months after joining the team. 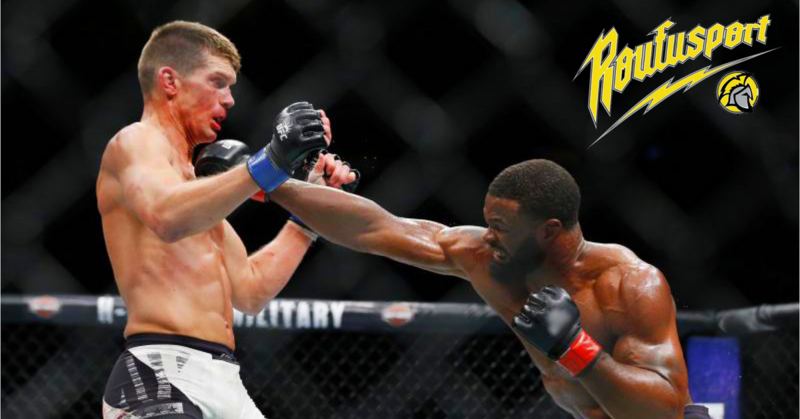 After knocking out Robbie Lawler to win the Welterweight world title and pick up a $50,000.00 Performance Bonus on UFC 201 July 30, 2016, Woodley has gone undefeated in 4 UFC title fights. When asked what it is about Roufusport, and the team’s namesake head coach Duke Roufus, that helped him succeed most, Woodley responded “He (Duke) made training fun again and is the missing ingredient to my success.” Heartfelt, and a piece of the puzzle many seek, but don’t often find… enjoyment in grueling, physical work/training. When Paul Felder joined the Roufusport team in January of this year he knew the change of scenery, and the literal spartan lifestyle he adopted, would do him good. And so far, it definitely has. Since joining the team, “The Irish Dragon” has gone 2-0, with two very impressive first round finishes earning him two $50,000.00 UFC Performance Bonuses and spring-boarding him into a UFC commentator spot on Dana White’s Fight Night Contender Series on UFC Fight Pass, which led to Felder taking a guest role as color commentator September 16th on UFC Fight Night on Fox Sports 1. Through August 2017 Roufusport’s elite varsity MMA team has compiled a stellar record, going 10-2 in the UFC, 2-1 in Bellator, and 1-0 in Dana White’s Contender Series. With 9+ months in, and 220+ teams vying for the top spot, Roufusport sits alone atop The Sporting News MMA Manifesto’s UFC Fight Team 2017 World Rankings in the #1 position (http://thesportsdaily.com/mma-manifesto/2017-mma-fight-camp-team-standings-august-update). The Roufusport fighting style has contributed to some of the more innovative and exciting moves seen in the Octagon today, like the famous Showtime Kick (vs. Benson Henderson), The Showtime Knee (vs. Donald Cerrone) and Alan Belcher’s famous Batman Punch (vs. Akiyama), which became the first “off the cage” strike in the UFC and, along with the Showtime Kick, opens every UFC PPV live show in the arena. Tyron Woodley joins Anthony “Showtime” Pettis as another Roufusport fighter Duke Roufus and his dedicated team of coaches, fighters and staff have taken to the top of the UFC mountain, with Showtime first winning the WEC Lightweight title in grand cage wall-walking fashion over Henderson to close out the promotion’s last ever event in December 2010 before being bought and absorbed into the UFC. Then in storybook fashion, Showtime snatched the UFC Lightweight title belt away from Henderson in August 2013 while fighting at the BMO Harris Bradley Center in his hometown of Milwaukee. Since that time, Anthony Pettis became the first UFC fighter to appear on the iconic Wheaties box cover and, along with Roufusport’s coaching staff, was the winning coach of the UFC produced The Ultimate Fighter-Season 20 reality television series. In addition, top UFC Flyweight contender Sergio Pettis, UFC Lightweight Erik Koch, UFC Welterweight Belal Muhammad and UFC Middleweight Gerald Meerschaert have all earned UFC Performance Bonuses as members of Roufusport’s fight team. To say Roufusport has positively impacted the lives of these talented athletes, and many more along the way, is an understatement. From Duke Roufus on down, the team’s no nonsense approach to “having fun while getting it done” has created the positive environment necessary for winning at all levels of the game. And more winning means more performance bonuses, more income, more opportunities and more success. To find out more about training with the Roufusport Fight Team, please email Training@Roufusport.com or call (414) 453-5425.